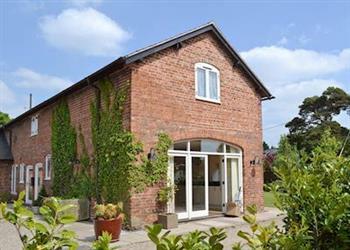 Bougheys Barn in Welshampton, near Ellesmere sleeps 8 people. Bougheys Barn near Ellesmere is located in the owner’s grounds; Bougheys Barn is perfectly placed in the picturesque village of Welshampton, on the outskirts of Ellesmere, a traditional market town set in the heart of the beautiful Shropshire countryside. This spacious detached barn conversion has been lovingly converted to provide high levels of quality furnishings and fittings throughout, as well as having its own private well-tended garden area, this units boast an amazing hot tub with year round use. Locally, within a short walk, there is a pub which is renowned for its good quality food. Ellesmere has a selection of individual shops, bars and restaurants. There is also the meres, where boating is available, the Shropshire Union Canal which for ambitious walkers or cyclists takes you over the borders into North Wales and into Llangollen, home of the National Eisteddfod, great for extreme water sports enthusiasts with its white water rafting, tubing and gorge walking. For the less adventurous, there is the steam railway, horse drawn canal barges, Chirk Castle and Erddig (National Trust). Back in Shropshire there is paintballing, go karting, Attingham Park, Shrewsbury, Ironbridge, Bridgnorth and Ludlow. The shop is 2 miles, with the pub and restaurant 500 yards from Bougheys Barn near Ellesmere. Bedroom 1: With king-size bed, door leading to garden and en-suite wet room with shower and toilet. Oil central heating (underfloor on ground floor), electricity, bed linen, towels and Wi-Fi included. Travel cot and highchair available on request. Lawned garden with sitting-out area and gas barbecue. Hot tub. Private parking for 3 cars. No smoking. Please note: There are steps from bedroom 1 leading to the garden. Holidays at Bougheys Barn run from Friday to Friday. Pets allowed at Bougheys Barn. For a better idea of where Bougheys Barn is, you can see Bougheys Barn on the map below. Bougheys Barn is in Shropshire; should you be on the lookout for a special offer, you can find all the special offers in Shropshire. It's always worth checking to see what is on offer at the moment. Do you want to holiday near Bougheys Barn (UKC526), you can see other cottages within 25 miles of Bougheys Barn; have a look to find your perfect holiday location.